Taste test: These are big, gargantuan ripple chips. If you took your steak and licked it, that's what these chips kind of taste like. But you should also lick the chips to find the flavor, too. We got one chip that tasted like a regular chip, so use the "lick the chip" method. Uneven distribution of the flavor powder. Consistency of the chip was good, however. Smell test: "Oh, man alive, what the hell is this world coming to?" Very strong smell, kind of like the Liptons French Onion dip dry package. 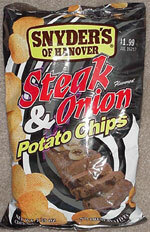 Trivia: Bag includes a rather unappetizing picture of steak slices and some onions.